Maybe you’d call this stuffing and maybe you wouldn’t. It’s based on barley instead of the traditional bread but it has all of the flavors of traditional stuffing. It makes a good side dish for poultry or pork chops whatever you call it. For me stuffing isn’t stuffing without sage. I grow sage in my backyard. The sage garnishing the plate is a selected variety called Berggarten sage. It has large, fat, oval leaves in comparison to leaves of regular sage making it ideal for garnishes. It has the same flavor as regular sage so can be dried and ground for cooking also. 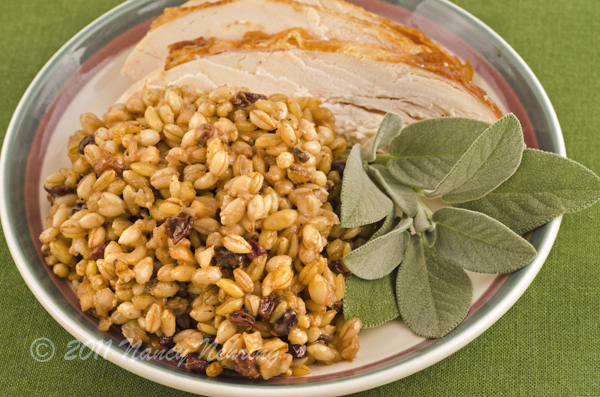 We’d like to thank Bob’s Red Mill for providing the barley, dried apples and black currants for this recipe. Place barley, water, and bouillon in a 2 quart saucepan for stove top or 3 quart bowl for microwave. Cover. Bring to a boil then reduce heat and simmer 90 minutes. Ideally all of the water should just be absorbed as the barley finishes cooking. Check near the end of cooking time and add boiling water if the barley is too dry or remove the lid if the barley is too wet. Barley will be chewy even when fully cooked. When cooking barley in the future, adjust water and/or cooking time as needed. Add remaining ingredients to pan or bowl, cover and simmer an additional 10 minutes. Serve warm. Cooked dried beans are a healthy addition to your diet but some people avoid them because they produce gas in our intestinal tract. You can easily eliminate all or most of the gas by adding just one step to the cooking process and it doesn’t even increase the preparation time. Gas is produced in the large intestine from a sugar present in dried beans that is too large to be absorbed through the small intestine wall. The good news for us is that this sugar is water soluble. Place the beans you want to cook in a large pot and fill it with water. I put 2 cups of beans in a 3 quart pot of water. The more water relative to beans the better. Bring the water to a boil, turn off the heat, cover the pot with a lid and let sit until cool – at least 1 hour. The beans will continue to cook as the water cools. Drain the water (and the gas producing sugar dissolved in it) from the beans and your degassed beans are ready to use. I use the same pot to make bean soup so I rinse the pot to remove any bean cooking liquid from it. 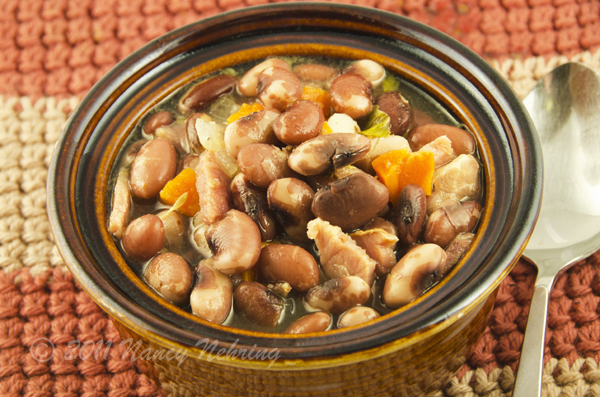 Some beans like Anasazi beans will cook completely or nearly so as the water cools. Other beans may need more cooking time but the 1 hour cooling counts as part of the total cooking time. It’s that easy! After our Easter ham, my mother would save the ham bone and pan drippings to make a big pot of navy bean soup. It was a good, hearty soup for the still chilly days of spring. I still make the same soup but with a few changes. First of all, I no longer save the pan drippings. I usually get a spiral cut ham with honey glaze these days. The sugar and spices in the glaze get into the drippings and add a terrible flavor to soup. Likewise, I don’t use the ham bone for stock. I usually get a small ham as I’m not serving 15 or more people like my mother did and the ham bone just isn’t large enough to make much stock. I substitute chicken stock as ham stock is not made. And then I have switched from navy beans to Anasazi beans. Well, I still think of it as the same soup. I use to think all dried beans were created equal but not anymore. Some beans like navy beans and Anasazi beans hold their shape well when cooked. Others like pinto beans get mushy and fall apart. That’s why pinto beans are used for refried beans, they mash easily, whereas navy beans or Anazasi beans do not mash well and refried beans made with them are mealy. Other beans such as black turtle beans have distinctive flavors. Anasazi beans are my favorite soup bean. The name Anazasi Bean® is a trademark used to popularize the bean as a gourmet bean beginning in the 1980s. The bean is also called Aztec bean, cave bean, New Mexico Appaloosa and Jacob’s Cattle. The bean cooks quickly (for a bean), stays firm and has a little more flavor than some other dried beans. The only other ingredient that you might not be familiar with is chipotle pepper. Chipotle peppers are jalapeno peppers that have been smoked and dried. The pepper gives a nice earthy taste and a little spice to the soup. I can buy the pepper either whole or ground. I use to buy it in the Mexican section of the grocery store but it is now in the regular spice section. I add either 1 whole pepper or 1/4 teaspoon ground pepper to the pot. I’m recommending that you start out with 1/8 teaspoon, add more if you like. Anasazi Bean is a registered trademark of Adobe Milling in Dove Creek, Colorado. Degas beans by placing beans and 2 quarts of water in 3 quart cooking pot, bring to a boil, remove from heat and place lid on pot, let cool (about 1 hour), then drain beans discarding water. Anasazi beans cook quickly for beans and will be cooked or nearly so by the time the water cools. Remove beans from pot if you haven’t already and continue with same pot. If you choose to use bacon fry until fat is converted to oil. This will take about 5 minutes, stir occasionally. The bacon will be “floating” in oil and the fat will be covered with tiny bubbles when it is finished. Saute onion in bacon fat (I leave the bacon in the pot) or olive oil. Add beans and remainder of ingredients including 2-2 1/2 quarts of water and simmer until vegetables are done, 15-20 minutes. 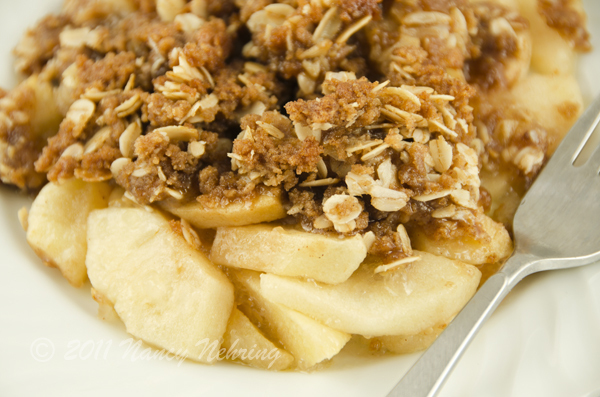 Fruit crisp is an easy dessert to make but one that I only make when I have fresh fruit. I use any firm fruit that I happen to have available – apples, pears, peaches, or cherries. I usually use apples though so I call it apple crisp. If my fruit is tree ripe and sweet, I don’t add any sugar to the fruit, just a little tapioca to thicken any juice that cooks out. I particularly like this topping because it has oatmeal in it for both the texture and the flavor. I pile the fruit high in the baking dish as it will shrink about half after baking. Toss apples with tapioca and place in 1 1/2 or 2 quart glass or ceramic baking dish. Mix sugar, flour, oatmeal and cinnamon in bowl. Cut room temperature butter or margarine into mixture with pastry cutter or fork until crumbly, like pie crust if you make pies. Bake at 350 degrees until apples bubble up around crust, about 45 minutes. I’m currently going through an audiobook listening craze and lately have been listening to books like The Omnivores Dilemma and Animal, Vegetable, Miracle and in listening to these I’ve been inspired to eat more fruits and vegetables than ever before. To expose myself to more tasty, local produce I’m subscribing to a service that delivers locally grown organic produce to my house once a week. Here’s a salad I put together with items from this week’s box of fresh, autumn produce and a few additional things from my fridge. Toss lettuce with balsamic vinaigrette. Peel and thinly slice persimmon and add to salad. 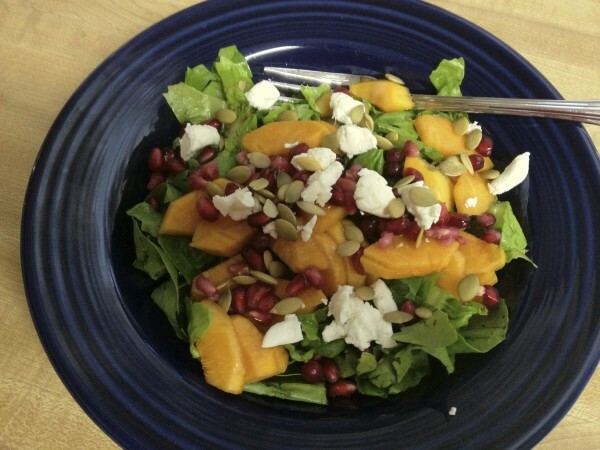 Top salad with pomegranate seeds, pumpkin seeds, and crumbled goat cheese. Disclosure: Bob’s Red Mill provide generous samples to Nancy and Carrie at their request. This post also contains Amazon affiliate links.